It’s important that both ailerons weigh the same, or as close as possible. One of my ailerons was a tad light, so I had to add a bit of weight. Believe it or not, I inserted a couple of nails in the end that was light and that solved the problem. 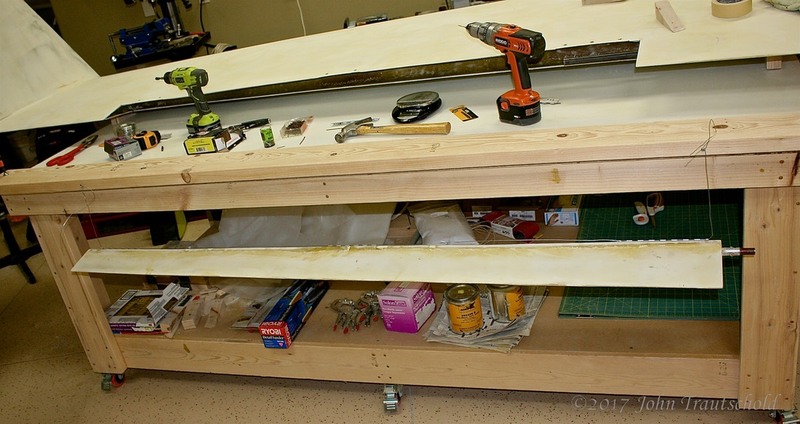 These nails are epoxied in and covered with fiberglass so there’s no worry about them coming out and jamming something! This is really a preliminary balancing. Once the aileron are painted they need to be balanced again. Balancing them literally means running a thin steel wire through the hinges (replacing the hinge pins) and then hanging it from a fixture. Once the aileron is level I then need to check to see if it’s leaning toward the aft end a few degrees. If it is, and both ailerons match within a degree or so, then we’re good to go. Crude, but effective method for checking the balance of the ailerons! The ailerons are now finished. That means it’s time to move on to the rudders. The process is similar - cut out the rudders from the winglets, add hinges and away we go, more or less! That process starts here!